Tropical Fruit Discussion / To people from tropical countries: how difficult is live tree export? 1) If someone wanted wanted to buy such an "exotic" (but non-endangered, not locally-rare) tree of a reasonable size (e.g. no more than a few years away from fruiting size, ~2-6 meters tall) to export from your country - do you think that would be possible to find a seller who could get a phyto / export approval for it? 2) What if the tree had to be dug up (e.g. one doesn't expect to find most "exotic indigenous trees of nearly fruiting size" in pots) - would this impose any barriers? 3) With reasonable effort, do you think it would be possible to find someone in the area (or who would be willing to go to the area) who knows what they're doing re: digging up, rootball-wrapping, and transporting a tree? E.g. in the US or Europe you'd hire a professional tree mover who would show up with a spade truck (who will charge several hundred dollars plus transport costs). But even doing the whole process by hand is fine so long as the people doing so know what they're doing. Total budget per tree (not just paying the owners, but also the movers, and for export costs, incl. shipping) would not be unlimited, but would be significant (thousands of dollars per tree, depending on tree size; for particularly large/spectacular trees, potentially up to $15k or so, maybe even more in exceptional cases), and if one tree was being sourced from a particular area, we'd probably try to source others as well (to combine shipping). Our government does not mandate bare-rooting, although non-bare-root trees have to have the phyto also certify the soil (and if it's a country that has the New Zealand flatworm, they either have to be bare-root or specifically note on the phyto that the flatworm is not found where the plant was acquired. I don't think it's found in any tropical countries.). This is nothing at all urgent - just a longer-term consideration. Tropical Fruit Discussion / Raising soil pH in a calcifuge plant? So, there's only a couple non-fruiting plants among my tropicals, and one of them is a drosera (sundew), which helps ensure that flying pests don't get out of control. The other evening I was doing my periodic pH measurements and I got to the drosera (a relatively recent acquisition, never-before measured), and the results were so off the chart that I actually went back and recalibrated my pH meter. Its soil was pH=3,1! Lowest measurement I've ever seen - that's like soda. Droseras certainly tolerate acidic soils, but they generally prefer at least pH=5,5 from what I've read, and too low pH hinders their growth rate. I was going to just lime it, but then I ran into another tidbit: apparently most droseras are calcifuges. They hate calcium. And they generally prefer nutrient-poor soils in general. Well, that leaves me in a conundrum: how do you raise the soil pH if the plant hates calcium, and most nutrients in general? Is my best bet just transplanting into new medium? Or should I just let it be, since it's seemingly healthy? Myrciaria spp (several): Love having a tray of water under them. Hate chlorine. Love iron. Like acid soil, pH=5,5-6,5. Like both organic and inorganic soils? Eugenia candolleana: Similar to myrciarias? Don't know as much about this one's soil preferences, but from some searching it sounds like they like acid, don't like chlorine, like iron, and don't like drying out. Garcinia intermedia: I see recommended pHs ranging from 5 to 7. Long germination times. Supposedly not picky about soil types. Soil should be watered frequently but not kept in a tray of constant water, perhaps? Hmm... better to use a more inorganic mix for better aeration / less risk of rot, or an organic mix for better moisture and nutrient retention? On-hand I have moss, fine vermiculite, a peaty soil, a richer soil, and sterilized beach sand that I've had running through flowing freshwater for a day to strip any salts out. I once grew a myrciaria before, and if I recall it wasn't too transplant sensitive; don't know about the other two. I imagine in all cases it'd be best to germinate in plastic bags or tupperware and then transplant. I remember having a big problem however with E. stipitata transplantation. I had like a dozen germinate and grow great, but every last one died when I tried transplanting them, no matter how gentle I was :Þ But I've had other eugenias which could care less when I transplant them, so I don't think it's a genus-wide problem. 1) Going with a 100% inorganic starting medium, and only moving them to soil when they outgrow it. Frequently moistened sand / perlite, so it drains well? 3) Keeping at least some of them in a humidity bag well past the germination stage (in case insufficient humidity was the cause, rather than fungus). My plants grow in an area that's high humidity, but not "near 100%"
Do these sound like good ideas? Any other suggestions? Has anyone else here tried out the Plantnet smartphone app? I'm loving this thing! It uses a neural net to try to identify plants from images of the leaves, stems, flowers, fruit, whatever. Sometimes it's unsuccessful, as you'd expect (that's an incredibly hard challenge), but it's successful more often than I'd expect, and I've had a number of times where the plant in question has been the first guess (for example, it got my tamarind right away). And every picture that you take and contribute to the app helps teach the app to recognize such images in the future. Also, while I expected the results to be biased towards common temperate plans (because I'd expect the user base to be biased toward that), instead i most commonly guesses (even when wrong) tropical fruiting plants. You can also narrow down the selection by family or genus. It's fun even if you don't have any unknown plants, but if you ever get into one of those situations where you have some seedling mixup and you're not sure what it is, definitely give it a try. * Opposing this, however, is real-world data showing that coffee production is higher in the sun than the shade - multi-year yields are just under 80% of max in full sun, 100% in 75% sun, a bit over 80% in 50% sun, and around 30% of max in 25% sunlight. "Good year" yields are even better for full sun - nearly as good in 100% sun as 75% sun, and nearly 4 times more in full sun than 25% sun. * The reason for this is that the internode length increases in the shade, and thus fewer flowers are produced (note: not discussed in the paper, but if one wants to counter this, blue light is known to reduce internode distances). * Somewhat (but not significantly) offsetting this is lower fruit drop in shade coffee. * Because energy is abundant in shade coffee, but full sun coffee produces more fruit, shade coffee yields a higher-quality fruit, while sun coffee stresses itself out to the point of resulting in a partial alternate-bearing habit. 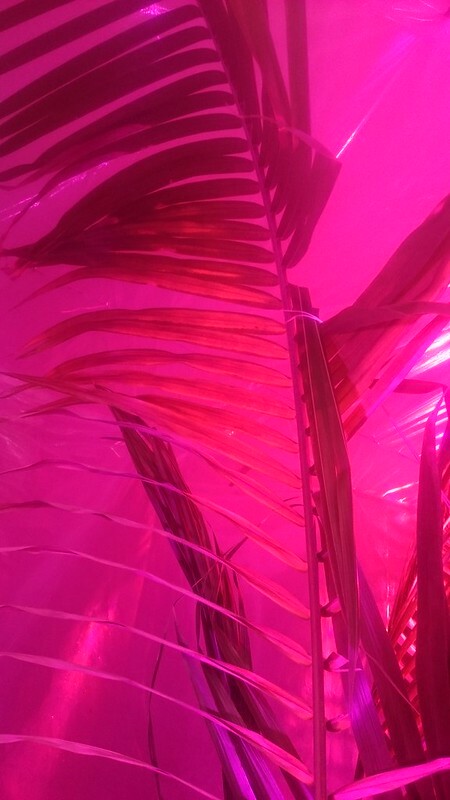 So, as you probably know, I'm involved in a project to build a series of greenhouse domes in Reykjavík combining normal commercial space (restaurants, coffee shops, workplaces, etc) with active cultivation of exotic tropicals. And to that end I've been accumulating data about every "interesting" tropical edible under the sun that comes onto my radar, to aid in plant selection. Since I've recently been working on citrus, I thought I'd ask: what citrus varieties would you recommend? We're as always looking for the best mix of taste, productivity, precociousness, attractive appearance / scent, ease of cultivation, interesting history/stories/other uses, and so forth. Fast growing and shade tolerant are plusses, but not essential Small fruited is probably better than large fruited, as it makes it easier to offer "samples", but this is further down the priority list. * C. limon "Kannu'on" - got to love any lemon whose smell gets described as "Fruit Loops cereal" Most lemon cultivars I've seen info on are described as producing all year, although I don't know about this one. * Meyer Lemon - just because they're generally well appreciated, as far as "lemons" go. * Mandarins - they're not spectacular or exotic, but they're a Christmas tradition here. * Ponkan - like giant mandarins, so see above. * Blood oranges - anthocyanin-rich and look neat. Anything else that should go under consideration? Citrus General Discussion / So citrus trees are *not* generally ideally full-sun plants? Maximum net CO2 assimilation of most citrus cultivars saturates at relatively low irradiance (600 to 700 umol m-2s-1), which is only 30 to 35% of full sunlight (1500-2200 umol m-2s-1) on a typical growing season day (Syvertsen, 1984). 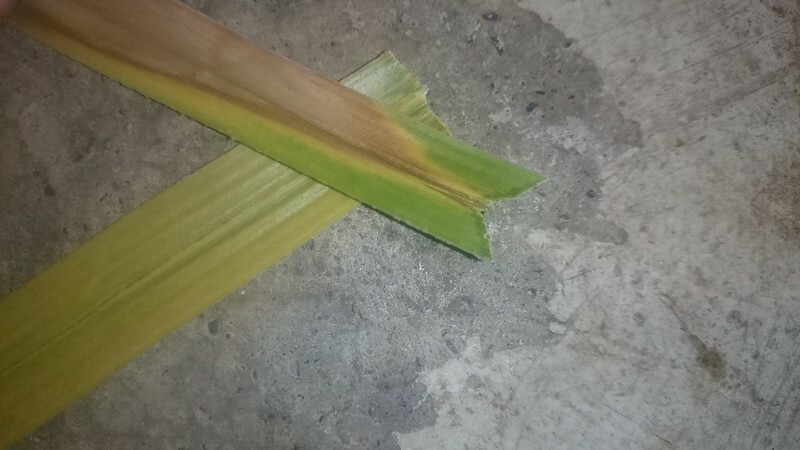 The excess radiant energy predisposes plants to photo-inhibition, heat stress and stomatal closure, resulting in a reduction in net photosynthesis (Pn), the ultimate source of fruit soluble solids. Experimenting with grapefruit, they found no meaningful change in yield for using 50% shade cloth from Apr-Jul, but a 35% yield improvement for using 50% shade cloth from Jul-harvest. 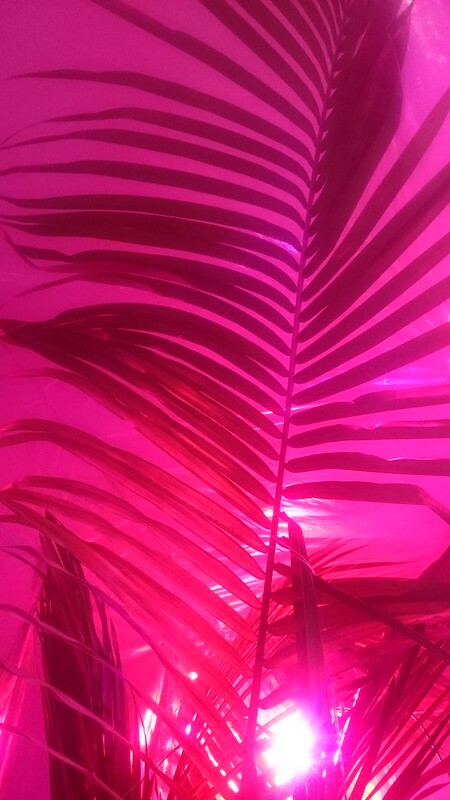 A caveat that they encountered was that while reducing light levels was good on sunny days, on dimmer days it reduced the light levels down to below the plants' limits, and thus reduced photosynthesis. So "adaptive" shade might have been even better. What's your experience with shading? I had always thought that, with a few notable exceptions (such as finger limes), citrus trees were full sun plants that were significantly adversely impacted by shade. But this argues otherwise. Could citrus be effectively intercropped? 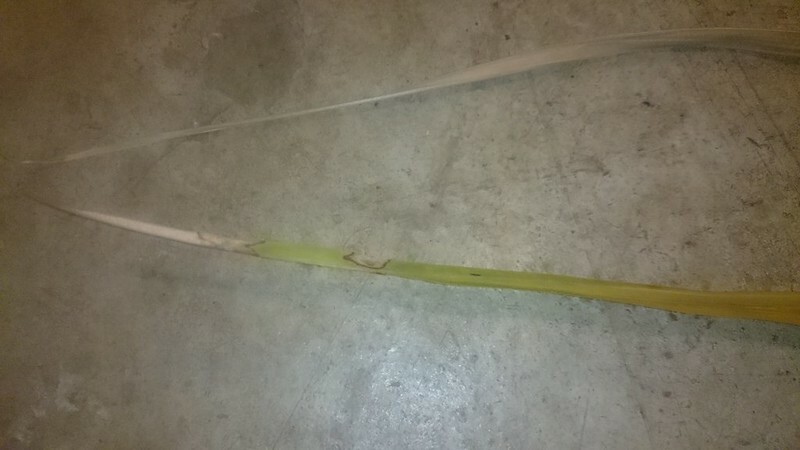 Tropical Fruit Discussion / Wow - neat trick, Pachycereus. I wish more plants had figured this one out! Right now I'm in the middle of researching good edible cactus. And honestly, Pachycereus pringlei (Cardón) isn't at the top of the list. It's not that the fruits are tasteless or insipid like many cactus fruits - they're sort of like molasses flavoured, somewhat dry saguaro fruits. But it's one of those cacti that has to get big to fruit, like its Saguaro cousins (at least it's faster growing than Saguaros!). 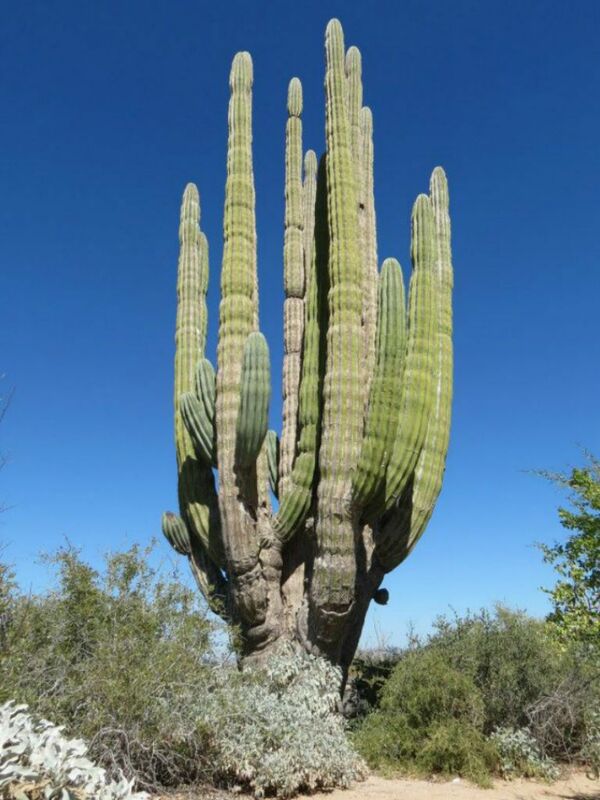 It's likely the largest cactus in the world, nearly 20 meters tall and over a meter in trunk diameter. Extremely massive; you don't want to run into something like this with your car. But that's not what I felt the need to mention. We all know of plants that have symbiotic relations with nitrogen-fixing bacteria. They release chemicals in the soil which encourage the microbes to migrate toward them, then enclose them in nodules, where they nurture them. We also know other plants that form root associations with mycorrhizal fungi; if these fungi are in the soil, the fungus infests the plant's roots, "stealing" sugars, but in exchange breaking down bound-up minerals in the soil for the plant to use. P. pringlei takes it a step further. It can grow on bare rock because of its associations with nitrogen-fixing bacteria and rock-decomposing fungi, but it can do so anywhere because it packages these bacteria and fungi into its seeds. Which I guess is a big advantage in a desert; things are so sparse, you can't count on the "soil" just happening to have what you need on-hand! A bird eats the fruit, leaves its droppings with the seeds some great distance away, and it's guaranteed to have the helper species it needs on-hand. Has anyone ever heard of any other plants doing this? So, I was looking at my compost pile today, and - noticing some langsat rinds on the top - I recalled reading about how dried langsat rind can be used as incense. So I decided to try it out. One quick recommendation - don't leave them in huge chunks that pack poorly together, cut them up to the degree necessary so that they pack in reasonably well together. One thing I was really impressed with was how it burns. 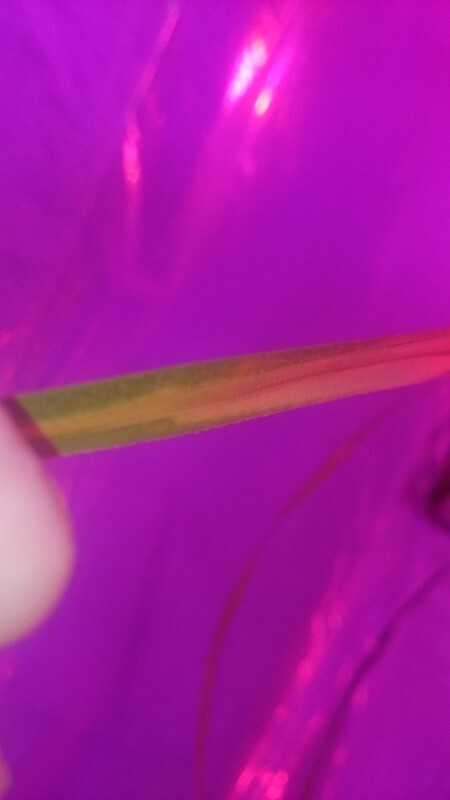 There's apparently a flammable oil in the rind - you can see it bubble out - and it maintains this perfect nice, slow, steady smouldering - just what you want in an incense. Nice pretty wispy waves of smoke come off of it. Unfortunately, the scent on its own wasn't remarkable - there was maybe a hint of langsat scent in there, but it was mainly just a smoke scent. I'll have to try this again, but this time dripping some essential oils onto the rind to give a more interesting aroma. But as far as reusing waste goes, this one really seems to work. ED: Found a bit more usable rind and tried it with some essential oils. 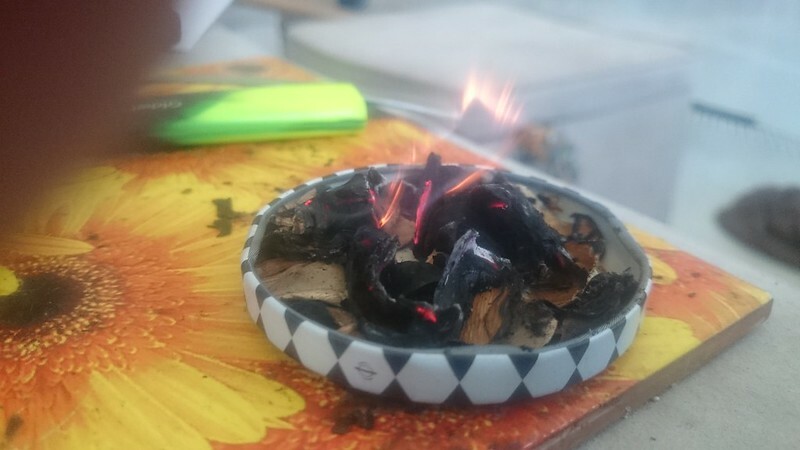 The oils turned out to act like an accelerant - which in a way is good to an extent, as it helps all of the pieces catch fire, but it also burns them up faster - and you don't really want to be burning *off* your essential oils either. I almost wonder if the best option might be something like langsat + a little essential oil "ignition" fluid + dried citrus peel, to get some sustained essential oil release in there. Tropical Vegetables and Other Edibles / Aztec Sweet Herb - does it or does it not contain camphor? Tropical Fruit Discussion / Forum members with phytosanitary certification? Tropical Fruit Discussion / Aaaargh! 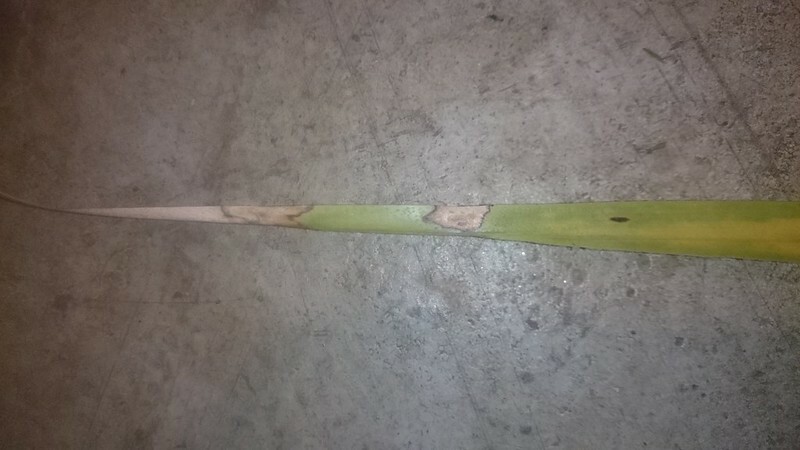 So, I recently had a number of plants showing signs of potassium deficiency and struggling. A soil potassium test revealed that it was low (nitrogen was high, phosphate normal). So, I gave them a nice helping of potassium sulfate from a bag I got on ebay long ago and but had only recently started slowly using up (not in formal product packaging, just a labeled ziplock). They all got worse, and a few that I'd had for years died. I was baffled, but something had been eating at me. When I bought a big bag of potassium sulfate at a store here (since I was running low on the ebay stuff), the compound didn't look like the contents of my old ebay potassium sulfate. So I set up a potassium test and sprinkled some into the test liquid. No colour change. Then I set up a nitrogen test and sprinkled some in. Rapid bright purple, off the charts. It's some bloody ammonium compound. Ammonium, a compound that makes potassium deficiency worse, and when over applied is toxic. Aaaargh! Still very much a work in progress, but I thought I'd share: as a tiny portion of the database project I've been working on, I wrote a program that parses plant habitat descriptions and combines that with climate data to determine what sort of native environments they're grown in (this is combined with some curated data concerning what conditions the plants are known to like growing in.). It looks at the plant's native altitude range and only includes points within the habitat areas which are within that altitude range. If it can't find any locations that match the stated altitude in the stated range (e.g. the resolution is too coarse), it uses what data it did find and adjusts temperature, etc for the altitude difference. 1) It's a computer without a brain having to read text. Subtlety will pass it by. I've tried to include common edge cases - for example, "Located in X, not found in Y" - it'll see Y but not parse it. It also tries to, when it sees "Found in X (Y)", where either X or Y is a subregion of the other, only parsing the subregion, not the whole. But expect some mistakes. Feel free to improve habitat descriptions to be more accurate! You can use countries, subregions, cities, etc. Just try to make sure that you don't name a place that has a more major (population, significance, etc) area with the same name! It understands adjectives such as cardinal directions (including e.x. "northeast", but not "northnortheast") as well as "central". Scattered city listings are just fine. Let me know when you make any changes of significance and I can re-run it. 3) It does not understand the common wording "through" - e.g. "Portugal through Greece". It will only look at the endpoints. Again, feel free to improve this by being more specific. But some of that data doesn't match other sites. For example, they show a much dimmer winter in Manaus than you get when you punch Manaus into PVWatts. I'm still trying to reconcile that. Another example is in humidity; the average humidity figures seem to match the figures you'll see reported for average humidities for cities on Wikipedia, but when you go to daily weather histories on Weather Underground, it feels a bit off, particularly on daytime humidity. Again, not sure how to reconcile that; this is just coming from the data I'm given. 5) There's still a good number of duplicate / synonym species that I need to work out, and a LOT more curating that needs to be done. A known bug is that sometimes it'll list "kill temperatures" as "minimum acceptable temperatures", although it's generally very obvious when it does that. 6) It ignores everything up to the first dash (if an "early first dash" is present), to avoid parsing e.g. whole continents. So, I've finally figured out the recipe to making my acerola flower: fertilize well, calcium-rich / higher-pH soil, good root aeration, significant dry period, then water and prune (no clue why pruning encourages flowering, but it sure seems to). Right now my acerola has more flowers on it than it's ever had on it in its whole life put together. Yet at least so far I'm not sure if I've gotten any fruit set. Are there any good tricks for that? 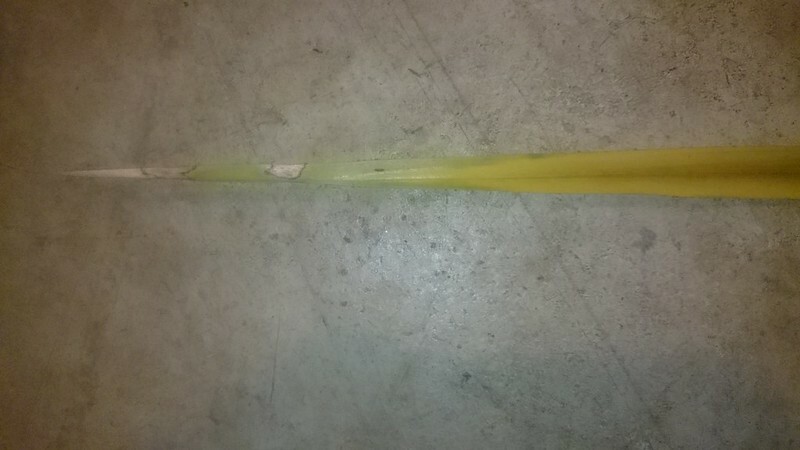 I've done some trying to pollinate with a sponge paintbrush, some tree shaking, and last night I have it a heaping serving of potassium sulfate, hoping that will help. Tropical Fruit Discussion / Is there anything worth doing with coffee berry flesh? About to harvest some coffee, and I'm wondering... is there anything worth doing with the flesh of coffee berries? I've sampled them before, and they're... underwhelming. Sweet, but a leafy taste. Wondering if there's any application in which they're actually good. Or whether I should just wet ferment the cherries to try to impart a sweeter flavour to the "beans". Much appreciated by natives in central Australia, particularly the Aranda people. Woody fruits up to 9cm in diameter; flesh inside is sweet, oily and milky, with a taste reminiscent of coconut, and very nutritious. C. pomiformis seeds are tiny, round, soft, and have a short lifespan. Shade tolerant. Dioecious. Fertilized by insects. Cannot be grafted or air layered, but comes true from seed. Available for only a short period of time; get 'em before they fly out the door! Tropical Fruit Discussion / Parkia biglobosa (african locust) - flower odour? 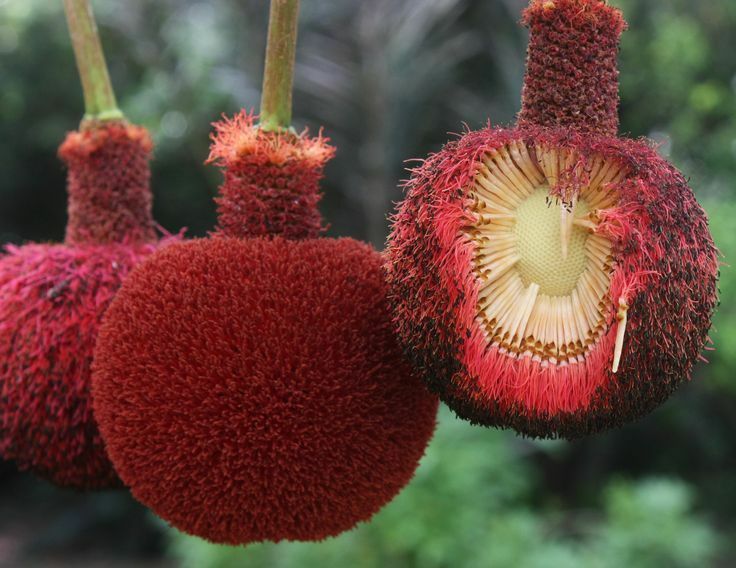 I'm finding conflicting information about the odor in the big pom-pom flowers of Parkia biglobosa. As one would guess, they're primarily bat pollinated (although capable of bee pollination), and so - reportedly - have a strong scent, like most bat-pollinated flowers. However, most bat-pollinated flowers have a strong bad scent. ... describes the scent of other Parkia species as "foetid, fruity or like cow manure", due to sulfur compounds, but finds no sulfur compounds in P. biglobosa. Their description of the "strong floral scent" of P. biglobosa (which peaks in the evenings) is "A heavy, sweet and somewhat stuffy scent". ... says that the flowers "may smell foetid and fruity like cow manure"
My *suspicion*, due to the striking similarity of the wording between the two sources, is that the World Agroforestry site is just getting that from a description of the smell of Parkia species' flowers in general, rather than specific for P. biglobosa. Specifically, the first paper cited "Wee & Rao, 1980; Hopkins, 1983; Gdnmeier, 1990" for that description, so I imagine that World Agroforestry gets that description from them too. But this is just a suspicion on my part. Has anyone here ever smelled a P. biglobosa flower? Also, while were on the topic of P. biglobosa, I've seen conflicting information about how big they are when they start to flower. I've seen one person say "Trees start flowering at 5 - 7 years while still comparatively small. ", suggesting that they might even be able to be grown in a pot; while another source says that they're quite large when they fruit, which begins at 5-10 years; and another source says that they grow up to 1 meter in the first year and up to 7m in the first 6 years. Is that "small size at first flowering" only if you dwarf them? * The main symptom is chlorosis, eventually progressing to necrosis. Chlorisis begins further down the leaflets, yellowing (pure yellow, not spotty/blotchy), affecting the central vein and the edges last. * First looked up *proper* fertilization for coconut palms, which for a palm the size of mine should be about 200 grams of my fertilizer I had been using** per month, plus extra potassium. I had probably been averaging about 50 grams, with no extra potassium - but it's hard to say because I hadn't been measuring. The fertilizer is 12-14-14. * I started out just giving a proper single monthly dose at the start of the month, but that did nothing to reverse what's clearly been a problem that's built up over time. 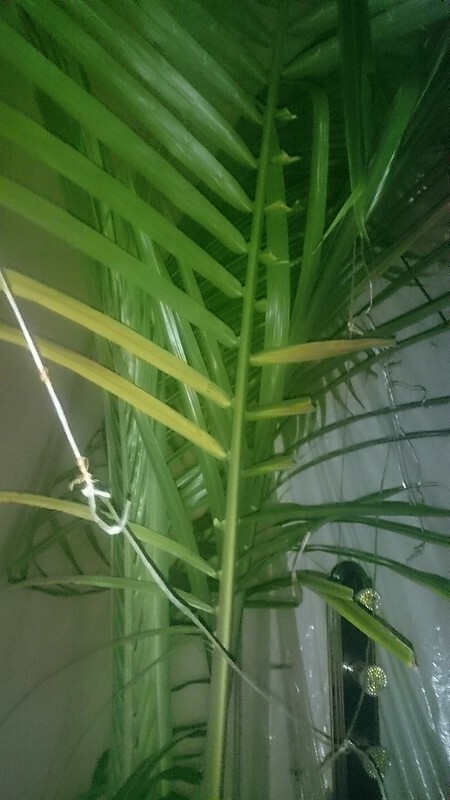 The palm is 3,2m (10' 6") tall to the top of the highest fronds, with the fronds starting to separate at around 80cm up (2' 6"), and a trunk diameter of 10cm (4"). The soil depth is 60cm, and the pot is 80cm wide. So in gallons, that's probably around 50 gal. 5 fronds - 2 old fronds undergoing chlorosis / necrosis to varying degrees, 2 mature and mostly or completely healthy fronds, and 1 new frond opening up. The other issue that comes to mind is root health. Shot suggested soil temperature, pathogens. Soil temperature should be around 24°C (75°F), day and night, all seasons, at all depths. Air temperatures vary, and increase with height, but probably average around 30°C (86°F), and humid. I didn't used to, but I've taken to misting my plants several times a day as well. I did have an outbreak of fungus gnats starting last month and peaking several weeks ago. Their numbers have been declining of late as I found a place where I could buy predatory insects (yeay!). They're still around, but not nearly as common. Apart from fungus gnats, the only other pest that I ever have had problems with is spider mites (they've killed more plants than I care to admit over the years). No unusual numbers of them of late, and I bought some predators for them as well just in case. Aeration: the pots have holes drilled at the bottom, but they're such large pots, and plastic, and the soil is so moist, that obviously root rot is something to consider. Normally I try to prevent this simply by not watering the large pots too often, but now I'm facing conflicting interests; I have to water to rinse fertilizers into the soil (and the more I water, the deeper they'll wash in)... yet if root rot is of concern then I want to water as *little* as possible. I have no frond wilting, so that's a good start. I did - 2-3 weeks ago - drill a lot of side holes. I might go in at some point and double the number of side holes. I obviously don't want to go so far that I ruin the pot's structural integrity, or I'll have to coat it in fibreglass to reinforce it - but I could probably do more. Regardless, the soil is very moist right now. 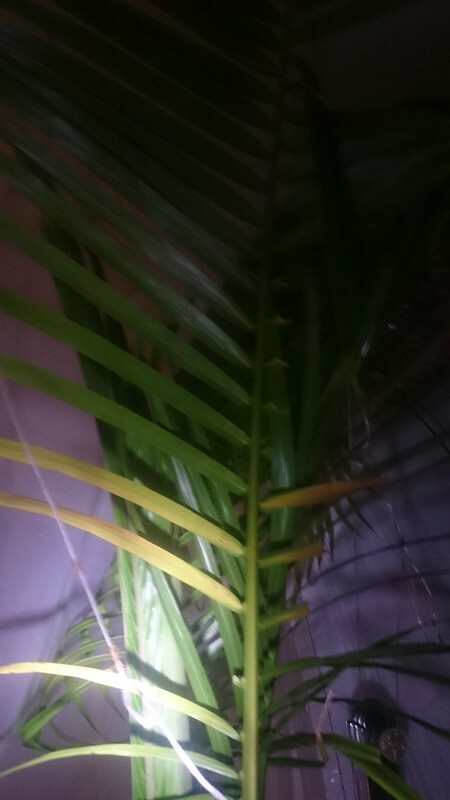 Question of whether I should be relocating the palm to outside the humidity tent to try to dry it out, or just backing off on waterings (aka, washing in nutrients) for a while. Again, there's no wilting, so maybe it's not a primary concern right now. Tropical Fruit Discussion / Casearia quinduensis - extinct species for sale at Guaycuyacu...? Has anyone asked Jim about this before? Either his ID is wrong (most probable), or he's selling seeds of a species that's thought to be extinct. Tropical Fruit Discussion / Plinia and Myrciaria yields - how well do jaboticabas produce? So far I've only found two references that seem of utility: one said that Myrciaria dubia / Camu Camu yields 12t/ha in cultivation (rather low by fruit standards, about 40% more than Mangosteen - a standard low-yielding fruit). The other states that a mature Jaboticaba (apparently Sabara) yields 1000 pounds (~400kg) in Brazil. Going with the assumption that by mature they mean "huge", and going with 9 meter (30 foot) trees, spaced 9x9 meters apart (from the same source: "He felt that 30 feet was the correct spacing without pruning"), this works out to around 50t/ha, which is a very large yield (say, high density oranges grown under optimal conditions, or double that of high density mango cultivation). For you growing jaboticabas, what would you estimate yields would be for your various species/varieties, and what said "optimum conditions" would be? I assume that you don't know t/ha figures, but I can work with any sort of figures - e.g. "The yield is similar to oranges", "I get about X pounds per fruiting and Y fruitings per year on a tree that's Z feet tall", etc. Even comparisons of annual yields between different jaboticaba varieties would be of use! Jim West has a species on offer, Clavija longifolia (mongon) (primrose family, Primulaceae), which like many of his species is somewhat difficult to find personal accounts of people growing it (although not as hard as Casearea (Caesarea?) quinduensis(?)!). Does anyone have personal experience with C. longifolia? From extensive googling, I've come up with: it is a very aesthetically attractive plant, with a palmlike growth habit (2-4m) but a rosette of "broadleaf"-style leaves at the top, and cauliflorous fruiting habit. The orange fruit appear to have a flesh that looks sort of like orange sherbert or caramel in pictures, with a thin, probably easily removed rind. Photos of the plant show it frequently growing (and fruiting) in varying degrees of shade, including some surprisingly deep, although I've found one picture that shows it in at least mostly sun if not full sun. Productivity looks relatively good relative to the size of its crown and the environments it's growing in. I did find one report that scarified seeds soaked for 36 hours took up to 4 months to germinate, with a 2/3rds seedling death rate, and that they apparently like their growing media constantly moist. It reportedly has a good smell, although it's not clear whether that's the flowers or some other part, and how much of the year that's present. Habitat: "tropical forests in the Andes between 500 and 2000 m from Venezuela to Bolivia " IUCN status: Near Threatened. Anyone have anything to add about this species or genus? The main thing I'm missing is fruit quality, and anything about cultivation difficulty/details, etc. I know at least one person here has grown it (akanonui). * Says it's slow growing, and "doesn't exceed 2 meters height after 2 years". Putting on a meter of height per year in a plant's first two years isn't slow growing at all. How fast does it actually grow? * Says it succeeds in both sun and partial shade. Yet I have trouble finding any pictures of it at all growing (let alone fruiting, aka "succeeding" IMHO) in any sort of shade... pics generally show it growing in the middle of an open field. Does it truly "succeed" in partial shade, and if so, how much shade? * The claims that large amounts acts as a laxative, and that large amounts cause a mild drunkenness, make for an interesting mental image. So if you eat a large amount, you end up drunk on the toilet? What's the actual deal with this interesting eugenia? Tropical Fruit Discussion / Is White Sapote really *this* productive? Some comparison numbers: A modern apple plantation, properly managed, yields about 65t per hectare of saleable apples, which is rather high by fruit yields. Peppers are 20t/ha. Papayas are 40t/ha. Mangosteen is 8,5t/ha. Etc. The highest that comes to mind, as far as fruits go, is babaco, at just over 100t/ha (banana is also huge - 60t/ha in the high intensity fields, 120t/ha in experimental conditions). Most fruits are somewhere in the 10-20t/ha range. "Mature trees can reach 15 to 18 m in height and produce 900 kg (2,000 lb.) of fruit per year. Thompson, (1972) reported a tree of 'Chestnut' produced nearly 2,700 kg (6,000 lb.) of fruit in 1971 in Vista, California. Grafted trees remain smaller and develop a better canopy than seedlings." Looking at pictures of large seedling white sapotes shows that they're moderately "vertical" trees, 1,5-2x as tall as they are wide (unlike smaller/grafted trees, which are broader). Let's say that they're planted on a square grid spaced at a distance of 1,3x their height; that should keep things nice and sunny for each tree. For a 16m tree that's 130,6m² per tree, or 76,5 trees per hectare. 900kg per tree is 69t per hectare - more than apples. 2700kg would be 207t/ha, which is just bonkers. Am I doing something wrong, or is white sapote crazy productive?